I don’t even know where to begin on this review. Jamie McGuire absolutely blew my mind in the best way possible. 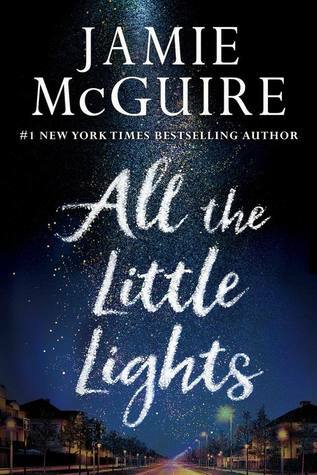 All the Little Lights is a YA stand alone by one of my favorite authors, Jamie McGuire. I have been a fan since I first picked up Beautiful Disaster and was excited to get an opportunity to read and review this book. So I’m going to start this review going straight to the ending of this book because Oh my God! I did not see that coming! I literally read this and yelled “What? !” out loud. This, ladies and germs, this is exactly how you get a person into a book and throw such a curve ball that the reader is left blinking in shock and needing to reread the book again to see the clues. This is the joy of a great writer who you know was probably writing this going “Hehe. You don’t know it, but you are in for a huge surprise.” That clever mind threw me for a loop. Wow. It elevated a really good book to a great book. This is not to say I didn’t already love the book. Elliot is fighting for the girl who he knows is his, Catherine is fighting to push him away and keep secrets from him, and both are dealing with racism and bullies. This book has everything and really, is everything that I could want in a YA. I didn’t want to put it down. Her writing is engaging and flows beautifully from chapter to chapter. Each one being told in a different POV of either Catherine and Elliot so we get both sides of their love story that is so much more than just a story about love. It’s about friendship, it’s about overcoming the odds, it’s about secrets that aren’t yours to say. I adored it.